Ambrogio da Fossano (Il Bergognone). 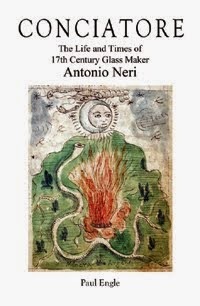 In 1612 Florence, Italy, Antonio Neri wrote L'Arte Vetraria, the first book entirely devoted to formulating and producing glass. Since glassmaking involved an intimate knowledge of chemistry, it is not so surprising to learn that he was an alchemist. However, many are surprised to learn that Neri was a priest in the Catholic Church. In fact, based on the timing of his first manuscript on alchemy, he is almost certain to have learned his craft while in training for the priesthood. As historian Luigi Zecchin pointed out, the Florentine Archdiocese records for this period were destroyed in a fire. Unfortunately, no other mention has been found that would confirm the particular sect to which Neri belonged, but there are intriguing clues. First, there are a few common sense deductions: We have the fact that he spent a great deal of his time in laboratories and glass foundries, which makes him an unlikely candidate to have led a parish. He is described in several sources as poor, but we know he came from a wealthy family; his father was the personal physician to the grand duke of Tuscany. This suggests that his sect required a mendicant oath of poverty. These are interesting clues, but they do little to narrow the field; there were at least a dozen sects in Florence that met this description, among them Carmelites, Benedictines, Dominicans, Augustinians and the Knights of Malta. After Neri’s death, his sponsor Prince Don Antonio de' Medici had a number of associates questioned in an attempt to recover the priest’s secret recipe for the philosopher's stone. From the testimony, we know that Neri's confessor was Benedetto Vanda, of the Carmelite run Santa Maria Maggiore church. The story is that Vanda's relatives were suspected of pressuring Neri for the precious secret on his deathbed. Another tantalizing passage is written by scholar Girolamo da Sommaia, a historian and prior of the convent church of the Knights of Saint-Etienne. Da Sommaia criticizes Neri for his claims of transmutation, but at the same time drops a very interesting clue about the priest’s affiliation. "Antonio [Neri] who had died in Florence five or six years earlier and was from San Jacopo in Campo Corbolino [church], said that he had the 'stone,' which he found in a pen-written book of secrets." San Jacopo is a church that the Knights Templar occupied since 1256 and when that order died out, the Knights of Malta took it over. They were a military order for whom Don Antonio de’ Medici held the title of Grand Prior of Pisa. Another possibility for Neri was the Dominicans. While it is true that they ran the feared Inquisition, they also ran two apothecaries in Florence that catered to the royal family. One was directly across the street from the Casino di San Marco, where Neri made glass at the beginning of his career. Any training for apothecaries would also have broad applicability to the field of alchemy. Closer to home, the Neri family's neighborhood church was at the Cistercian monastery Cestello (a Benedictine offshoot), and their parish church was the nearby Benedictine cathedral of San Pier Maggiore. The Cistercians did provide a young Galileo with his early mathematical training and notable among the Benedictines in Florence was Abbot General Orazio Morandi, who harbored a strong interest in alchemy. But any implication here to Neri’s home order is tenuous at best. Evidence suggests that one of Antonio's sisters became an Augustinian nun and a brother may have become an Augustinian Abbot, suggestive yes, but nothing that could be called conclusive. Was the famous glassmaker Antonio Neri Carmelite, Benedictine, Dominican, Augustinian, a Knight of Malta? Until more convincing evidence comes to light, for now we must say that we simply do not know.